A photo taken in Buenos Aires, Argentina, on February 23, 2007. 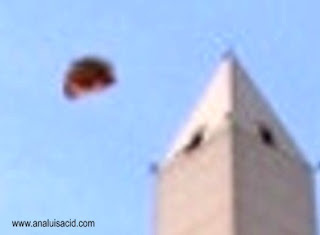 The witness says that he was with his family, taking pictures of the obelisk, and that the object that appears in the photo was not visible to their eyes, adding that they took several photos in 20 second intervals and that what could be a chance UFO appears in only one of them. They used a Sony DSC-P200 camera with a normal exposure setting. The author wishes to use the pseudonym "El Gocho", although his real name is known to Ana Luisa Cid.